Overall, EV owners are extremely satisfied with their Low Emission vehicles. More than three quarters of 654 respondents gave their EV a score of 9 or 10 out of ten. Owners find them fit-for-purpose, a pleasure to drive, and to have very low running and maintenance costs. Their environmental benefits are particularly satisfying for many owners. Restricted range and occasional mechanical and technical faults niggled a few respondents, but the main reason for a minority of low scores over the past nine months was apparent premature battery capacity fade in one variant of one model of EV. Even that turned out to be an instrumentation error rather than a real problem with the battery, so we expect that satisfaction scores would be even higher in the coming months. Each month since September 2017, Flip the Fleet has asked New Zealand EV owners to answer a simple question: “How satisfied are you with your EV?”. The owners were invited score their vehicle between 0 (being completely unsatisfied) and 10 (being the totally satisfied). Here we show you results of the 3,493 individual scores provided by 654 owners so far. Respondents were given the option to comment on the reason for this month’s score. Our long-term aim is to track changes in how satisfied members are with their vehicles overtime, and identify issues that seem to lead to lower levels of satisfaction. 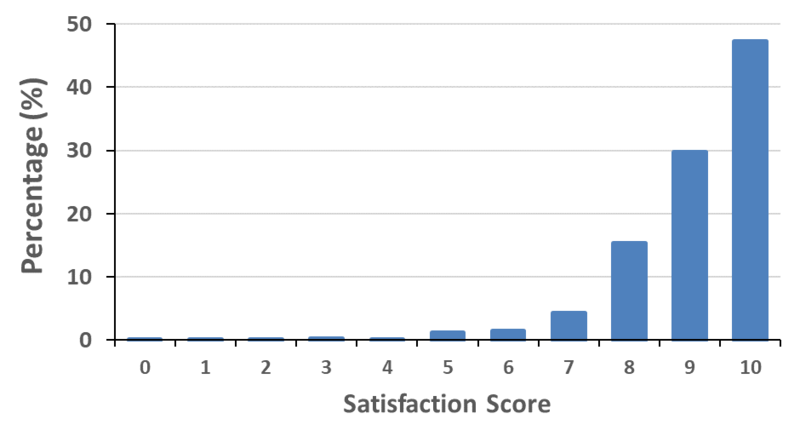 Over three quarters (76.8%) of the satisfaction scores were a 9 or 10 (Figure 1). Only 7.7% of the scores were below 7. Figure 1: Percentage (%) of satisfaction scores provided by Flip the Fleet EV owners from September 2017 to July 2018. 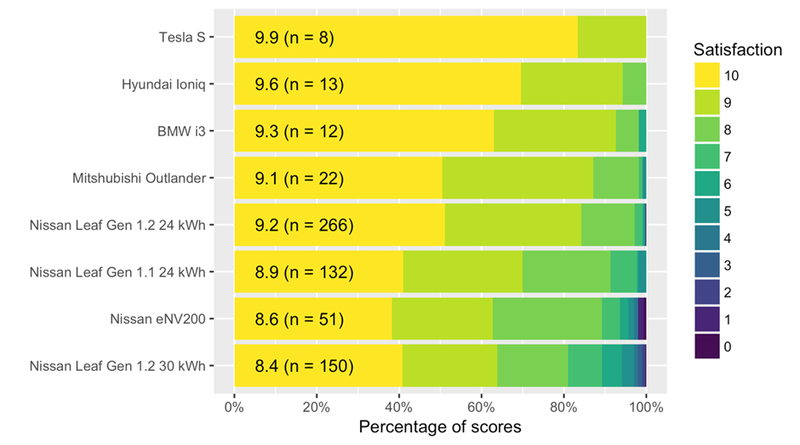 Tesla S owners reported the highest average satisfaction level, with all scores provided being either a 9 or 10 (average score of 9.9 from 8 Tesla S owners, see Figure 2). Drivers of the Hyundai Ioniq, BMW i3, Mitsubishi Outlander and Nissan Leaf Gen 1.2 24kWh all scored their vehicles above a 9 on average. Even the oldest ‘entry-level’ EV model, the 1st generation 24kWh Nissan Leaf had an average satisfaction score of 8.9. Owners of a 30 kWh Nissan Leaf were the least satisfied, but even these averaged 8.4 out of 10. Figure 2. EV satisfaction level according to vehicle model. The average satisfaction level by model type were calculated from 3502 satisfaction scores provided by 654 EV owners in New Zealand from September 2017 to July 2018. 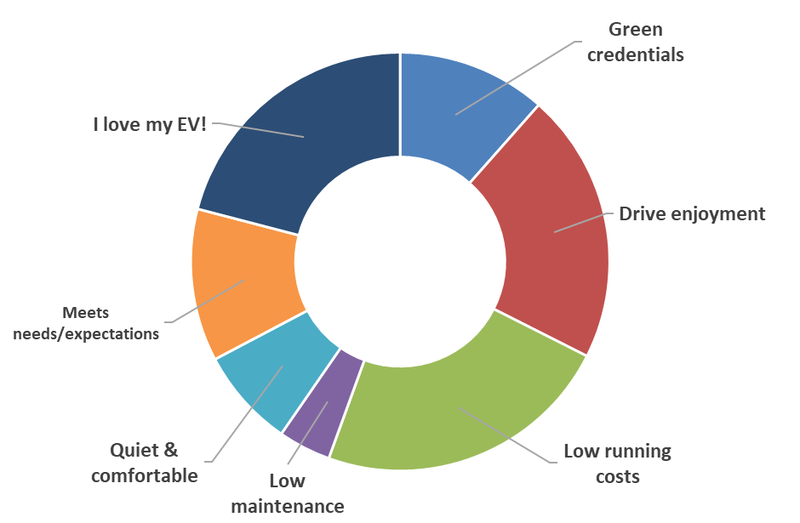 Along with reporting owner satisfaction levels, we wanted to uncover the key parts of ownership – be it the drive experience, the financial savings, the green credentials, or something else – that decides how much joy you receive from your EV. We were also interested to learn about any EV qualms you’ve had to date, and how far these have shifted you from a satisfied state. You sure love your EVs! Low running and maintenance costs were the most satisfying part of owning an EV (mentioned in 21% of all comments, Figure 3), followed closely by the impressive driving experience (16%). An equal amount expressed general pleasure in the form of “I love my EV!” (16%). Green credentials (9%) and a match to needs and expectations (9%) produced content to a lesser degree, while a quiet, comfortable ride was also said to satisfy (6%). Amongst the other (20%) responses were assurances that everything was “all good” (16x responses), that owners were smiley, happy beings (15x smiley-face responses), and a reiteration of previous reasons (70x gave “same as before” responses). A handful of Other comments indicated EV ownership of just 1-4 months – too short a time frame for detailed comment. Figure 3: EV attributes (expressed as percentage of 2409 comments provided) communicated by 654 Flip the Fleet members. Quicker than expected battery degradation and limited range were the stand out challenges affecting EV ownership (mentioned in 15% and 10% of all comments respectively, Figure 4). Mechanical or technical faults (3%), cooler weather (2%), and insufficient public charger availability (1%) also lowered owner satisfaction level. Other challenges included fast depreciation rates, inability to tow and drive through deep water, the desire to drive a “normal looking car”, and the need to plan. Figure 4: EV challenges (expressed as percentage of 2409 comments provided) communicated by 654 Flip the Fleet members. 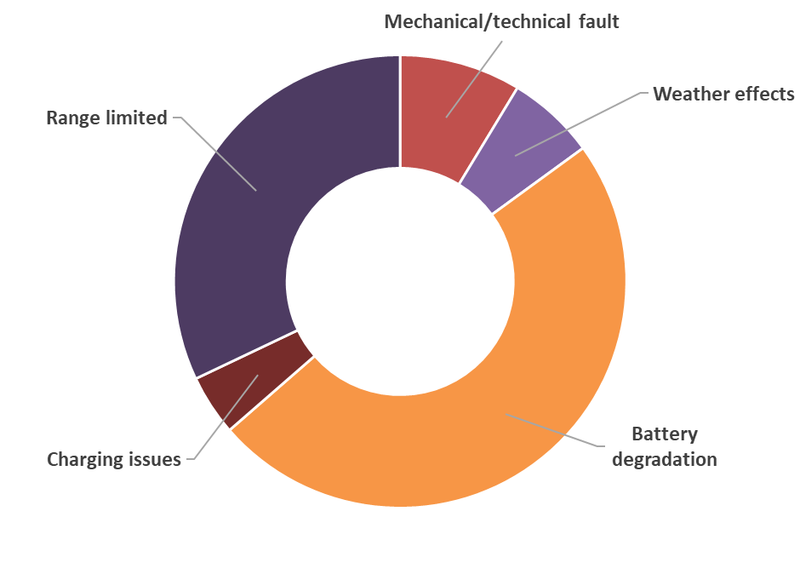 Apparent battery degradation featured in 25% of 200 comments by 30kWh (Fig. 5). This undoubtedly reflects the way State of Health and battery capacity bars were apparently dropping fast over much of the period encompassed by these surveys (https://flipthefleet.org/2018/30-kwh-leafs-soh-loss/). The threat was eventually traced to instrumentation error and a firmware patch was made available by Nissan (https://flipthefleet.org/2018/30-kwh-nissan-leaf-firmware-update-to-correct-capacity-reporting/). Comments on social media networks make it obvious that most 30 kWh Leaf owners are relieved and have somewhat restored faith in their vehicle’s battery, so we expect that the satisfaction scores and worry about battery capacity fade will decline in the coming months. 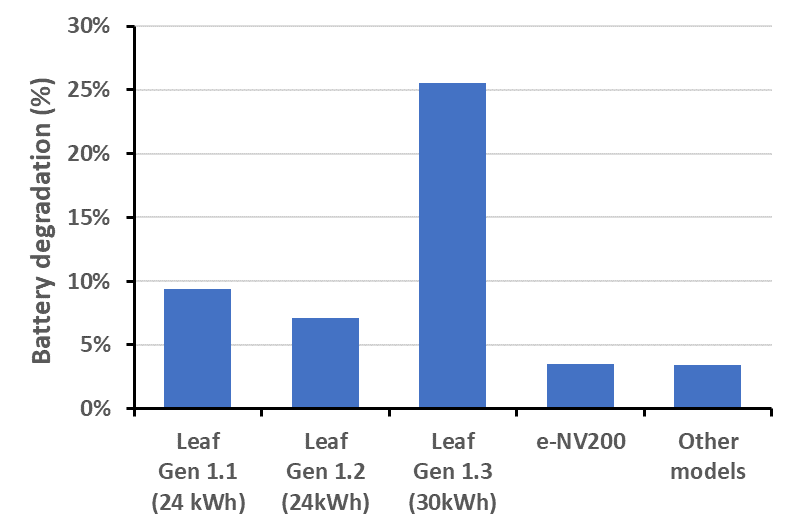 There were marginally higher levels of concern about battery health among owners of the oldest Nissan leaf Batteries (Gen 1.1, manufactured between 2010 and 2012) than among owners of Gen 1.2 (2013-2016) 24 kWh Leafs. Battery concerns are lowest among eNV200 and all other EV models combined (Fig. 5). Despite some concerns about range limitation and battery degradation, most owners remain highly satisfied with their EVs. Even with a decreased maximum range, the EV is still “fit for purpose” in many cases, leading to an unwaveringly high satisfaction level: “Does exactly as we expected. Could do with longer range, but we knew what we were getting when we purchased and is perfect for our commute” (satisfaction level of 10). 1-Click survey #20 that asked FtF members about changes in mobility patterns since purchasing an EV (https://flipthefleet.org/2018/1-click-survey-20/). There were subtle changes in mobility of some households, but not for two-thirds of owners. This is consistent with the overall conclusion of the satisfaction scores – the EVs overwhelmingly do what their owners expected them to do and have been seamlessly integrated into their families or small businesses transport needs. Despite a few niggles and inconsistencies, the overall joy of the drive, the resonance with “low-carbon lifestyles”, a tangible sustainability “conversation starter”, and the unique ability to “power the house in a power cut, to keep the fridges going” all make for a well satisfied EV Glee club! The apparent premature degradation of 30 kWh Leaf battery health gave many owners a real scare e.g. “This month we dropped to 10 bars and GOM now gives us only 149km on 100% charge. This will be unacceptable when we go on holiday” (satisfaction level of 5); “we love the car, great drive, but the reduction in range we’ve experienced since buying it has been very disappointing. We live rurally and needed the 30kwh range to make it work, so from a range (degradation) perspective not happy” (satisfaction level of 3). The firmware/head unit updates have obviously restored a lot of confidence in the last few months: “Back to perfect – just got 30kWh firmware upgrade & performance figures are back to where they were at time of purchase 8 months ago. Yeeha!” (satisfaction level of 10); “SOH seems to be creeping up slightly again (80.48%). I have decided to be less obsessed with SOH and just drive my Leaf. I do love it, especially with current petrol prices in Auckland” (satisfaction level of 9) “Improved as have had BMS update that has improved battery results” (satisfaction level up to an 8). Inadequate number, type and viability of public chargers frustrates some owners i.e. scores ranged from 9 to 6 for those who commented on charging difficulties: “need more fast chargers…one in each town?” (satisfactions score of 6); “I found the current state of the public charging infrastructure inconvenient, and the extra time for charging to be tiring (when trying to cover 500ks in a day)” (satisfaction score of 7); “Have to travel somewhere without practical charging options; so I am renting an ICE. Not the fault of the car, but the infrastructure is still lacking in some ways” (satisfaction level of 8). The need for a fast charger in Waikouaiti or Palmerston was mentioned several times, and a disconnect between the Dunedin/Christchurch and Central Otago charging networks has been making trips to places like Naseby incompatible with lower-range EVs. EV to the rescue (sometimes)! At home charging is ace, but need public charge to fuel the change! Hi. Just wondering whether you are going to add a field to your monthly data capture to track whether 30kWh leaf owners have have their LBC firmware updated and maybe add it as a filter option on the battery bars/SOH charts? Mine is being done this week. Unfortunately My motor vehicle dealer had to truck the car to Hamilton from New Plymouth to get it. There isn’t a requirement for a new field as, given the data entered, I can generally infer if the update has been done. No plans at this stage to add a filter option on the dashboard plots but the custom plots I generate take whether the car has had the update into account. Soon I’ll publish stats on the number of cars that have had the update done. Hope you get your car back soon! I recognise one of my comments above, and note that the LeafSpy is much more accurate now that my 30kWh Leaf has had its firmware update, and that my 10 bar battery is back to 12 bars. The kWh capacity is completely accurate now with the firmware update. As more people get the firmware upgrade I will be surprised if the 30kWh Leaf stays at the bottom of the heap for #:10 for enjoyment.